Take a second look the next time you see jet-streams way up in the atmosphere. Are they lingering for a long time? Do you see a pattern or grids forming? These are not commercial airlines creating these trails in the sky. Geo-engineering programs that claim to prevent global warming by spraying toxins into our atmosphere are commonly referred to as "chemtrails." 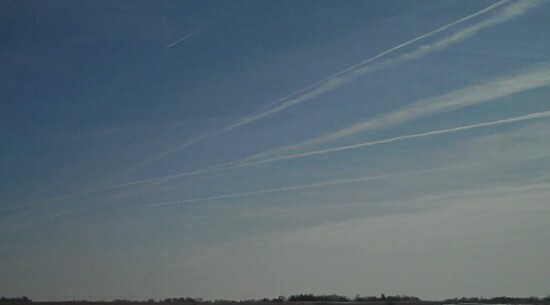 Most people assume the white, fluffy trails being emitted from some jets as they fly across the sky are condensation trails from exhaust, or "contrails." But common sense informs us that contrails do not occur in crisscross grids across the sky, remain overhead long after the plane(s) have left the sky, or continue to expand throughout the day, culminating in a veil of fog that eventually falls to the earth. Chemtrails have become a common occurrence both nationwide and around the world, delivering massive doses of toxic materials over not just our farmlands and homesteads but also over some of the planet's most pristine environments, including Mount Shasta in California and remote areas of the Hawaiian islands. Testing of soils and aquifers, including lakes, ponds, and streams, conclusively proves that the chemtrails are composed of toxic levels of aluminum, barium, and strontium, impacting negatively on every living bio-system exposed. The EPA declares 1,000 parts per billion as an unacceptably toxic level of aluminum. Testing of soil and water sources on and around Mount Shasta shows 61,000 parts per billion of aluminum, 3,090 parts per billion of barium, and 375 parts per billion of strontium. The pH balance of the soil in this region is being dramatically compromised as a result of chemtrails, including the poisoning of the snow that covers this glorious mountain, contaminating the myriad water sources the melted snow supplies. G. Edward Griffin's documentary What in the World Are They Spraying? (RealityZone.com/whatspray.html) is perhaps this topic's most compelling and exhaustive film. It presents information that is must-see, if we have any hope of saving our natural resources, including our ability to grow organic food the way God intended. And therein lies the horror. The geo-engineering programs appear on the surface to be a partnership between the U.S. Department of Agriculture (USDA), the Environmental Protection Agency (EPA), the military (DOD), the Department of Energy (DOE), and the Department of Science & Technology (DST). The stated purpose is to effect weather, slowing down global warming by blanketing the atmosphere with "pollution particles" (MSNBC.MSN.com/id/30112396/) and/or microscopic shards of aluminum to reflect the sun. Sadly, precious few studies examining the fallout (literally) from these programs have been conducted relative to negative impacts. It gets worse. According to the documentary, in 2009, the U.S. Patent Office granted patent 7582809 (Patents.com/us-7582809.html), among others, jointly to the USDA and the Brazilian Enterprise for Agriculture Research. This patent protects genetically modified seeds that are resistant to massive levels of aluminum. The composition of materials covered in the patent, and others like it, match induced compositions of aluminum, barium, and strontium found in the soil and water sources in numerous locales nationwide. These toxic levels have only occurred in the past five years, coinciding with the onset of the geo-engineering's chemtrails. The pH balances of the soil necessary for growing food around Mount Shasta, and numerous other sites, including the Hawaiian islands, is slowly being neutralized, losing forever the requisite acidity for proper farming. Naturally, whoever owns the patents for genetically modified seeds that resist aluminum will have control of a significant portion of the world's food source. This fits perfectly with the newly passed Food Safety Modernization Act of 2010, mandating the use of specific seeds for food production. As hard as this is to believe, dismissing the possibility that the nation's natural resources are deliberately being compromised is far more dangerous. Not only are our leaders crushing the financial stability of the world's economies; they are destroying our ability to survive on our own. Don't take my word for any of this. Investigate for yourself. Begin by watching What on Earth Are They Spraying? Read the Food Safety Modernization Act of 2010. Do a Web search for "chemtrails," "geo-engineering," and "weather manipulation." The amount of evidence is overwhelming if you just peek, let alone research in earnest.